Japanese Episode AG 170: "The Entrance of the Tower Tycoon, Lila!" American Episode 440: "Talking A Good Game!" Satoshi is ready for his Battle Tower challenge! 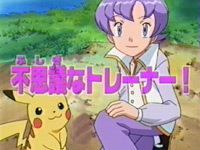 As the trainer from Masara Town prepares for his upcoming match, he meets a kid who is able to communicate with pokemon! After demonstrating this ability with a wild Spear and a Gyarados, the young genius talks to Pikachu and learns a few things about Satoshi. Suddenly, the Rocket-Dan appear and attempt to kidnap the electric mouse! Satoshi is able to prevent his pokemon's abduction, but he gets his clothes soaked in the process. Satoshi is invited to the youngster's house to dry off and, while there, finds out that the person he thought was a young boy is really a girl named Lila! After talking with her for a bit, Satoshi runs off to the Battle Tower to face the Frontier Brain. When he arrives, he learns that Lila is the Frontier Brain for the Battle Tower! Without wasting any time, the match against the Tower Tycoon begins. Satoshi's Heigani faces off against Lila's Houdin and loses due to Lila's ability to communicate with her pokemon without issuing any verbal commands. Next, Satoshi chooses Kentauros, who he had sent to him by Orchid-Hakase. Unfortunately, Kentauros is also no match for Lila's powerful psychic-type pokemon, so Satoshi sends Pikachu as his final pokemon. Pikachu takes a few hits but is eventually able to defeat Houdin with a powerful Thunderbolt. Lila's second pokemon is Metagross. Since Pikachu had already taken so much damage in the previous match, it doesn't take long for Metagross to defeat Pikachu with a Hyper Beam attack. Now that Satoshi has lost all three pokemon, Lila is declared the winner! Can Satoshi rebound and defeat the Frontier Brain in a rematch? To be continued! The sixth Frontier Brain! Lila is a unique character in that she's a female version of Lang, the guy in that one Jouto episode. Other than that? Well...she's assumed to be a (very feminine-looking) boy for the first half of the episode, so that's something. And, in the next episode, we learn that she has a crush on Satoshi. It's strange that the anime producers decided to add all these different quirks to a character who only appears in two episodes. It makes you wonder why they fleshed Lila out so much when so many other video game characters are so bland and boring. What was it about Lila that made her stand out to the anime producers? Why does she get to have all this stuff going for her when none of the other Frontier Brains do? Since the anime decides to make Lila's gender ambiguous for the first part of the episode, it's important that her voice doesn't betray that. She needs a voice that's feminine enough to sound like a girl while having just enough masculinity in it to sound like a pre-pubescent boy. The Japanese VA nails it perfectly. The English version, predictably, does not. Anabel sounds like an older woman and doesn't seem to be even trying to sound even a little bit masculine. I mean...Zoey sounds more like a boy than she does! While Satoshi can be forgiven for thinking that Lila is a boy, Ash is just flat-out stupid for not knowing Anabel's gender. Kentauros keeps its Japanese voice. Moo! Max: "Ash asked Professor Oak to send Tauros the other day." In the Japanese version, Masato says that Orchid-Hakase sent the pokemon yesterday (kinou), not "the other day." The dub implies that Ash thought about using the pokemon days in advance and, presumably, had time to train with it. Again...it's a minor change, but it's a change nonetheless. But I guess the big question is...why would Masato know about Satoshi's Kentauros being sent over while Haruka (based on her surprised reaction) doesn't? What else is Satoshi telling Masato that he's not telling his other travel companions...? This will amuse all the "the dub is so much better than the Japanese version all you elitist snobs can just move to Japan if you like it so much!!!" people. At the end of the episode, the narrator does his usual "Satoshi just lost the battle, he'll want a rematch, bla bla bla" thing. Well, in the very last line of the episode, the narrator goofs up and asks if Satoshi will be able to get his sixth badge. Not Frontier Symbol. Badge. The dub kind of glosses over the whole Frontier Symbol and talks about Ash's lost battle, so it doesn't make the same mistake. Badges and Frontier Symbols are basically the same thing, so I can see how the mistake can be made (especially since they've been talking about "badges" for almost ten years now). Still, it's an amusing goof-up and shows that even the Japanese version makes mistakes every now and again. One-third of nine seconds are added to the episode's TO BE CONTINUED... screen.